تخلیه پساب‌های رنگی به اکوسیستم‌های طبیعی خطرات جدی را برای محیط زیست و حیات آبی ایجاد نموده است. مالاشیت سبز یک رنگ بازی است که کاربردهای صنعتی بسیار گسترده به‌خصوص در صنعت آبزی پروری در سطح دنیا دارد. در این پژوهش کاربرد طراحی ترکیبی مرکزی تحت روش سطح پاسخ در جذب رنگ مالاشیت سبز از محلول‌های آبی با استفاده از نانوجاذب ترکیبی کلینوپتیلولایت- نانو ذرات آهن (Cl-nZVI) بررسی شد. ساختار جاذب تولید شده با استفاده از آنالیزهای میکروسکوپ الکترونی روبشی، آنالیز عنصری به روش تفرق اشعه ایکس و آنالیز تعیین ویژگی‌های مغناطیسی توصیف شد. اثر پارامترهای مختلف شامل pH، غلظت اولیه رنگ و دز جاذب بر میزان کارایی جذب برای یافتن بهترین شرایط جذب مورد مطالعه قرار گرفت. 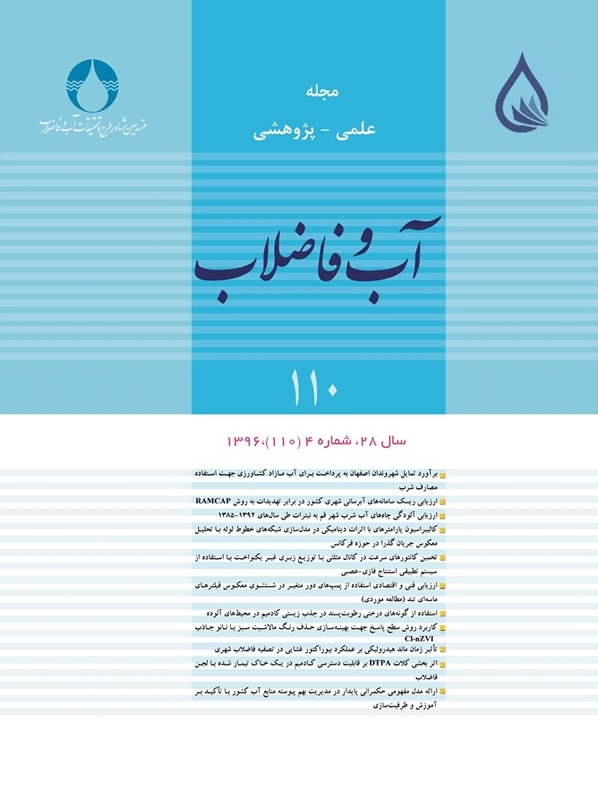 در مجموع20 سری آزمایش توسط نرم افزار (Design Expert.7.0) طراحی شد و کارایی جذب به‌عنوان پاسخ به نرم‌افزار داده شد. مقادیر بهینه برای سه متغیرpH، دز جاذب و غلظت رنگ مالاشیت سبز به‌ترتیب برابر با 6/5، 43/1 گرم در لیتر و 21/49 میلی‌گرم در لیتر بوده است. تحت شرایط بهینه پارامترهای مؤثر در فرایند جذب، کارایی جذب بالایی (90/57 درصد) برای حذف رنگ MG به‌دست آمد. به‌علاوه میزان مطلوبیت در فرایند بهینه‌سازی 963/0 به‌دست آمد. بر اساس نتایج به‌دست آمده، جاذب Cl-nZVI می‌تواند یک گیرنده مناسب و ارزان قیمت برای جذب رنگ مالاشیت سبز از پساب صنایع نساجی و فعالیت آبزی پروری باشد. Disposal of effluents containing dyes into natural ecosystems pose serious threats to both the environment and its aquatic life. Malachite green (MG) is a basic dye that has extensive industrial applications, especially in aquaculture, throughout the world. This study reports on the application of the central composite design (CCD) under the response surface methodology (RSM) for the optimization of MG adsorption from aqueous solutions using the clinoptilolite nano-zerovalence iron (Cl-nZVI) nanocomposites. The sorbent structures produced are characterized by means of scanning electron micrograph (SEM), energy-dispersive X-ray spectroscopy (EDS), and vibrating sample magnetometer (VSM). The effects of different parameters including pH, initial MG concentration, and sorbent dosage on the removal efficiency (R) of MG were studied to find the optimum operating conditions. For this purpose, a total of 20 sets of experiments were designed by the Design Expert.7.0 software and the values of removal efficiency were used as input response to the software. The optimum pH, initial MG concentration, and sorbent dosage were found to be 5.6, 49.21 mg.L-1, and 1.43 g.L-1, respectively. A high MG removal efficiency (57.90%) was obtained with optimal process parameters. Moreover, a desirability value of 0.963 was obtained for the optimization process. Ajemba, R. O., 2014, "Adsorption of malachite green from aqueous solution using activated ntezi clay: Optimization, isotherm and kinetic studies", International Journal of Engineering, 27(6), 839-854. Amini, M., Younesi, H. & Bahramifar, N., 2009, "Biosorption of nickel (II) from aqueous solution by Aspergillus niger: Response surface methodology and isotherm study", Journal of Chemosphere, 75(11), 1483-1491. Andersen, W. C., Turnipseed, S. B. & Roybal, J. E., 2006, "Quantitative and confirmatory analyses of malachite green and leucomalachite green residues in fish and shrimp", Journal of Agricultural and Food, 54(13), 4517-4523. Auta, M. & Hameed, B. H., 2011,"Optimized waste tea activated carbon for adsorption of Methylene Blue and Acid Blue 29 dyes using response surface methodology", Journal of Chemical Engineering, 175, 233-243. Bekçi, Z., Özveri, C., Seki, Y. & Yurdakoç, K., 2008, "Sorption of malachite green on chitosan bead", Journal of Hazardous Materials, 154(1-3), 254-261. Bekçi, Z., Seki, Y. & Cavas, L., 2009, "Removal of malachite green by using an invasive marine alga Caulerpa racemosa var. cylindracea", Journal of Hazardous Materials, 161(2-3), 1454-1460. Bhowmick, S., Chakraborty, S., Mondal, P., Van Renterghem, W., Van den Berghe, S., Roman-Ross, G., et al., 2014, "Montmorillonite-supported nanoscale zero-valent iron for removal of arsenic from aqueous solution: Kinetics and mechanism", Journal of Chemical Engineering, 243, 14-23. Blowes, D. W., Ptacek, C. J., Benner, S. G., McRae, C. W. T., Bennett, T. A. & Puls, R. W., 2000, "Treatment of inorganic contaminants using permeable reactive barriers 1", Journal of Contaminant Hydrology, 45(1-2), 123-137. Cao, J., Wu, Y., Jin, Y., Yilihan, P. & Huang, W., 2014, "Response surface methodology approach for optimization of the removal of chromium(VI) by NH2-MCM-41", Journal of the Taiwan Institute of Chemical Engineers, 45(3), 860-868. Chatterjee, S., Kumar, A., Basu, S. & Dutta, S., 2012, "Application of response surface methodology for methylene blue dye removal from aqueous solution using low cost adsorbent", Journal of Chemical Engineering, 181-182, 289-299. Cheng, R., Jiang, Z., Ou, S., Li, Y. & Xiang, B., 2009, "Investigation of acid black 1 adsorption onto amino-polysaccharides", Journal of Polymer Bulletin, 62(1), 69-77. Culp, S. J. & Beland, F. A., 1996, "Malachite green: A toxicological review", International Journal of Toxicology, 15(3), 219-238. Culp, S. J., Blankenship, L. R., Kusewitt, D. F., Doerge, D. R., Mulligan, L. T. & Beland, F. A., 1999, "Toxicity and metabolism of malachite green and leucomalachite green during short-term feeding to Fischer 344 rats and B6C3F1 mice", Journal of Chemico-Biological Interactions, 122(3), 153-170. Daneshvar, N., Khataee, A., Rasoulifard, M. & Pourhassan, M., 2007, "Biodegradation of dye solution containing malachite green: Optimization of effective parameters using Taguchi method", Journal of Hazardous Materials, 143(1-2), 214-219. Feng, R., Wei, C., Tu, S. & Sun, X., 2009, "Interactive effects of selenium and arsenic on their uptake by Pteris vittata L. under hydroponic conditions", Journal of Environmental and Experimental Botany, 65(2-3), 363-368. Ghaedi, A. M., Ghaedi, M., Vafaei, A., Iravani, N., Keshavarz, M., Rad, M., 2015, "Adsorption of copper (II) using modified activated carbon prepared from Pomegranate wood: Optimization by bee algorithm and response surface methodology", Journal of Molecular Liquids, 206, 195-206. Ghorbani, F., Sanati, A. M., Younesi, H. & Ghoreyshi, A. A., 2012, "The potential of date-palm leaf ash as low-cost adsorbent for the removal of Pb(II) Ion from aqueous solution", International Journal of Engineering, Transactions B: Applications, 25(4), 269-278. Hameed, B. H. & El-Khaiary, M. I., 2008, "Batch removal of malachite green from aqueous solutions by adsorption on oil palm trunk fibre: Equilibrium isotherms and kinetic studies", Journal of Hazardous Materials, 154(1-3), 237-244. Hernández, M. A., Corona, L., González, A. I., Rojas, F., Lara, V. H. & Silva, F., 2005, "Quantitative study of the adsorption of aromatic hydrocarbons (Benzene, Toluene, and p-Xylene) on dealuminated clinoptilolites", Journal of Industrial and Engineering Chemistry Research, 44(9), 2908-2916. Huang, C. H., Chang, K. P., Ou, H. D., Chiang, Y. C. & Wang, C. F., 2011, "Adsorption of cationic dyes onto mesoporous silica", Journal Microporous and Mesoporous Materials, 141(1-3), 102-109. Jiang, Z., Xie, J., Jiang, D., Yan, Z., Jing, J. & Liu, D., 2014, "Enhanced adsorption of hydroxyl contained/anionic dyes on non functionalized Ni@SiO2 core–shell nanoparticles: Kinetic and thermodynamic profile", Journal of Applied Surface Science, 292, 301-310. Kaushik, P. & Malik, A., 2009, "Fungal dye decolourization: Recent advances and future potential", Journal of Environment International, 35(1), 127-141. Keränen, A., Leiviskä, T., Hormi, O. & Tanskanen, J., 2015, "Preparation of cationized pine sawdust for nitrate removal: Optimization of reaction conditions", Journal of Environmental Management, 160, 105-112. Li, Y., Zhang, Y., Li, J. & Zheng, X., 2011, "Enhanced removal of pentachlorophenol by a novel composite: Nanoscale zero valent iron immobilized on organobentonite", Journal Environmental Pollution, 159(12) 3744-3749. Mall, I. D., Srivastava, V. C., Agarwal, N. K. & Mishra, I. M., 2005, "Adsorptive removal of malachite green dye from aqueous solution by bagasse fly ash and activated carbon-kinetic study and equilibrium isotherm analyses", Journal of Colloids and Surfaces A: Physicochemical and Engineering Aspects, 264(1-3), 17-28. Mourabet, M., El Rhilassi, A., El Boujaady, H., Bennani-Ziatni, M. & Taitai, A., 2014, "Use of response surface methodology for optimization of fluoride adsorption in an aqueous solution by Brushite", Arabian Journal of Chemistry, 1, 1-11. Muralidhar, R., Chirumamila, R., Marchant, R. & Nigam, P., 2001, "A response surface approach for the comparison of lipase production by candida cylindracea using two different carbon sources", Journal of Biochemical Engineering, 9(1), 17-23. Nairat, M., Shahwan, T., Eroğlu, A. E. & Fuchs, H., 2015, "Incorporation of iron nanoparticles into clinoptilolite and its application for the removal of cationic and anionic dyes", Journal of Industrial and Engineering Chemistry, 21, 1143-1151. Naseri, E., Reyhanitabar, A., Oustan, S., Heydari, A. A. & Alidokht, L., 2014, "Optimization arsenic immobilization in a sandy loam soil using iron-based amendments by response surface methodology", Journal Geoderma, 232-234, 547-555. O’Carroll, D., Sleep, B., Krol, M., Boparai, H. & Kocur, C., 2013, "Nanoscale zero valent iron and bimetallic particles for contaminated site remediation", Journal of Advances in Water Resources, 51, 104-122. Parshetti, G., Kalme, S., Saratale, G. & Govindwar, S., 2006, "Biodegradation of malachite green by Kocuria rosea MTCC 1532", Journal of Acta Chimica Slovenica, 53(4), 492-498. Pavan, F. A., Gushikem, Y., Mazzocato, A. C., Dias, S. L. P. & Lima, E. C., 2007, "Statistical design of experiments as a tool for optimizing the batch conditions to methylene blue biosorption on yellow passion fruit and mandarin peels", Journal of Dyes and Pigments, 72(2), 256-266. Porkodi, K. & Kumar, K. V., 2007, "Equilibrium, kinetics and mechanism modeling and simulation of basic and acid dyes sorption onto jute fiber carbon: Eosin yellow, malachite green and crystal violet single component systems", Journal of Hazardous Materials, 143(1-2), 311-327. Rahman, I. A., Saad, B., Shaidan, S. & Sya Rizal, E. S., 2005, "Adsorption characteristics of malachite green on activated carbon derived from rice husks produced by chemical–thermal process", Journal of Bioresource Technology, 96(14), 1578-1583. Samiey, B. & Toosi, A. R., 2010, "Adsorption of malachite green on silica gel: Effects of NaCl, pH and 2-propanol", Journal of Hazardous Materials, 184(1-3), 739-745. Shu, H. Y., Chang, M. C., Chen, C. C. & Chen, P. E., 2010, "Using resin supported nano zero-valent iron particles for decoloration of Acid Blue 113 azo dye solution", Journal of Hazardous Materials, 184(1-3), 499-505. Skorupskaite, V., Makareviciene, V. & Levisauskas, D., 2015, "Optimization of mixotrophic cultivation of microalgae Chlorella sp. for biofuel production using response surface methodology", Journal of Algal Research, 7, 45-50. Srivastava, S., Gupta, A., Srivastava, P. & Abhinav, A., 2004, "Acute toxicity of malachite green to fingerlings of common carp, Cyprinus carpio", J. Biol. Mem., 30(2), 120-121. Thirugnanasambandham, K., Sivakumar, V. & Maran, J. P., 2015, "Response surface modelling and optimization of treatment of meat industry wastewater using electrochemical treatment method", Journal of the Taiwan Institute of Chemical Engineers, 46, 160-167. Wang, C., Luo, H., Zhang, Z., Wu, Y., Zhang, J. & Chen, S., 2014a, "Removal of As(III) and As(V) from aqueous solutions using nanoscale zero valent iron-reduced graphite oxide modified composites", Journal of Hazardous Materials, 268, 124-131. Wang, J., Liu, G., Zhou, C., Li, T. & Liu, J., 2014b, "Synthesis, characterization and aging study of kaolinite-supported zero-valent iron nanoparticles and its application for Ni(II) adsorption", Journal of Materials Research Bulletin, 60, 421-432. Wang, S. & Ariyanto, E., 2007, "Competitive adsorption of malachite green and Pb ions on natural zeolite", Journal of Colloid and Interface Science, 314(1), 25-31. Wu, Y., Jin, Y., Cao, J., Yilihan, P., Wen, Y. & Zhou, J., 2014, "Optimizing adsorption of arsenic(III) by NH2-MCM-41 using response surface methodology", Journal of Industrial and Engineering Chemistry, 20(5), 2792-2800. Yongsheng, R., Jun, L. & Xiaoxiao, D., 2011, "Application of the central composite design and response surface methodology to remove arsenic from industrial phosphorus by oxidation", The Canadian Journal of Chemical Engineering, 89(3), 491-498. Zhang, J., Li, Y., Zhang, C. & Jing, Y., 2008, "Adsorption of malachite green from aqueous solution onto carbon prepared from Arundo donax root", Journal of Hazardous Materials, 150(3), 774-782. Zhou, X., Lv, B., Zhou, Z., Li, W. & Jing, G., 2015, "Evaluation of highly active nanoscale zero-valent iron coupled with ultrasound for chromium(VI) removal", Journal of Chemical Engineering, 281, 155-163.